If you have tried to use a button in a web app, to copy instantly a piece of information, you may know that it is not as easy as it seems. Also, you may find difficult to implement it and executing a copy command, and it is only supported in the recent browsers. 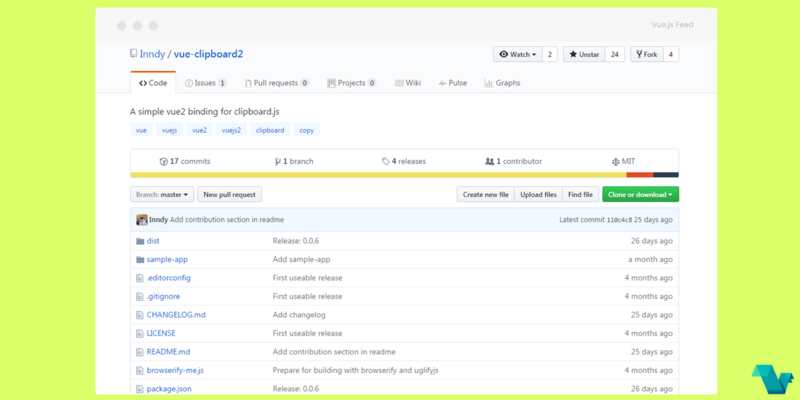 The vue-clipboard2 plugin comes into play acts as a wrapper to Clipboard.js offering aquick and simple solution. Copying text to the clipboard shouldn't be hard. It shouldn't require dozens of steps to configure or hundreds of KBs to load. The directive can be used in combination like v-clipboard:success where you can execute a function on success like throwing an alert to inform the user the text is copied. You can find the plugin on GitHub along with everything you need to start, and save yourself the trouble of creating this from scratch.